Our mission is to provide excellence in the delivery of community oriented police services and through community participation, improve the quality of life. The Clintonville Police Department is dedicated to working with the community to provide the best possible service for our city. The purpose of this web site is to assist the public with questions and providing frequently requested information available at your convenience. Our goal is to work together with the community to provide a safer and happier community. We also welcome your input about our web site and our department, so please feel free to leave us your feedback. 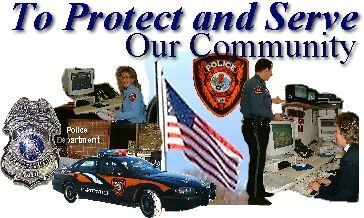 The Clintonville Police Department employs 11 full time officers, who include our Chief, Captain, 3 Sergeants, a Police School Liason Officer (PSLO) and 5 patrol officers. We also employ 4 part time officers, and 4 full time dispatchers and 4 part time dispatchers, which makes our dispatch service available to public 24 hours a day, 7 days a week. We are very proud of this, as this type of dedication to the community is sadly becoming a thing of the past for smaller communities. We are also proud to say it was the combined effort of nearly our entire department family in researching and writing of the information contained here that made this web page possible.